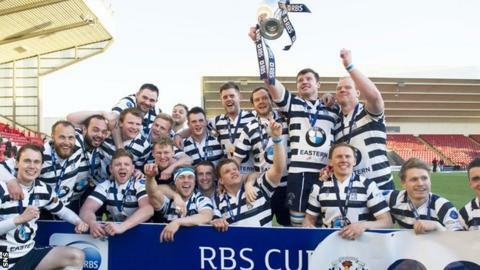 Heriot's have lifted the RBS Cup after defeating Glasgow Hawks 31-10 in the final at Broadwood Stadium. The Edinburgh side, who finished fourth in the RBS Premiership, scored tries through Harry Boisseau, captain Jack Turley and Liam Steele. Graham Wilson added two conversions. Hawks managed one try in response from Brendan Cullinane, with Jack Steele converting and also adding a penalty for the side who finished fifth in Scotland's top flight.